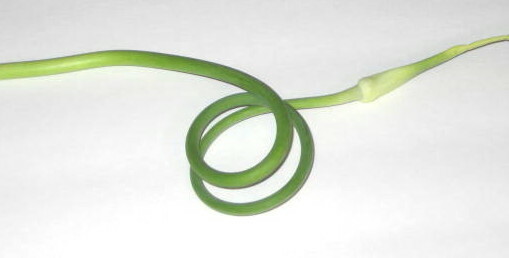 For those that have never heard about garlic scapes, just let me tell you that in some dishes it is the best part of whole garlic plant. In my plant growing zone 6b I harvest scapes at end of June just after they form piggy tail (full circle turn) and then store them in sealed plastic bag in fridge. They do last a long time, last year I was cooking with scapes in November. I love to grill them on BBQ or sear them in a frying pan, either way they turn sweet and tender even though when raw the bottom end may seem a bit woody. They are even better when seared and then cooked in liquid like a sauce or soup. And, of course, most favorite way to use garlic scapes is Pesto. Contrary to what many people think when they hear about garlic scapes pesto, they are not all that garlicky at all. The garlic taste is very mild. I will try to pan fry them roughly chopped in lots of olive oil and then run them through blender, sort of like cooked scapes pesto. I think that it will work. Looks like another subject for a recipe post. Here are some dishes in which I used scapes last week as a side dish or garnish. Chicken Teriyaki with red pepper and scapes. Pan fry red pepper and scapes till soft, add chicken thigh strips, stir fry for 3 minutes, add teriyaky sauce and cook another 3 minutes, uncovered. Serve on bed of rice with lightly salted cucumber and radish slices, no dressing. In this version I skewered pieces of pork tenderloin, bacon, onion, red pepper and zucchini, smothered with barbecue sauce and grilled on moderately hot grill with lightly oiled garlic scapes on side. 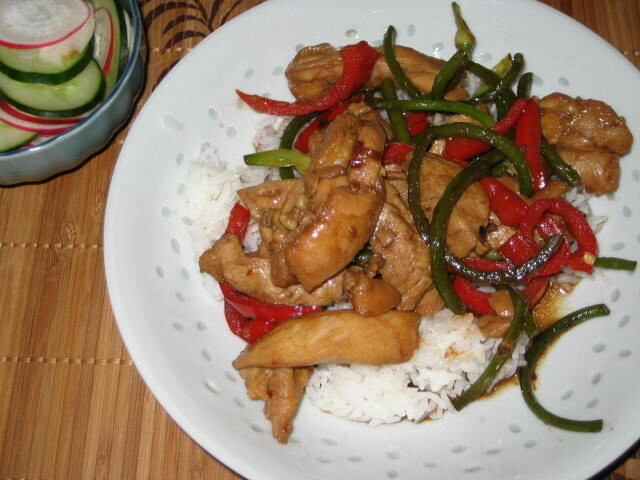 I served it on bed of shredded Napa cabbage and with rice and cucumber salad. 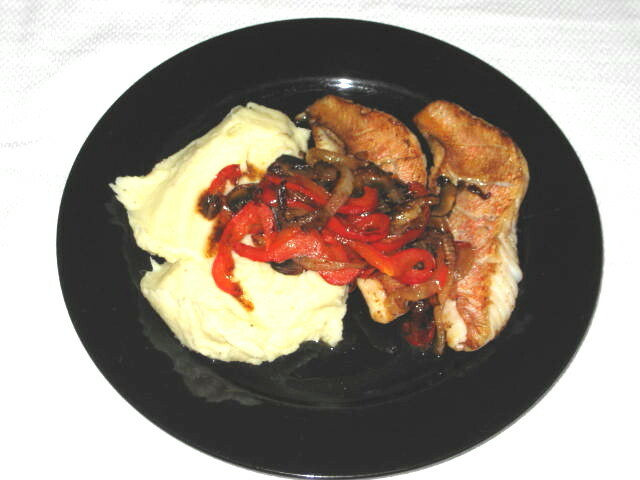 Ocean Perch with Mashed Potatoes. The perch is cooked same way as Salmon with Crispy Skin. High heat and short time with flesh side down first and skin side after. The scapes were cooked together with red pepper and white onions till all veggies were nicely caramelized. As for mashed potatoes I run boiled baking potatoes through food mill and then mixed the riced potatoes with sour cream, butter and milk. So rich and so good!! !